Redcoats Return to Newport, 17 Nov.
“What do you think of the Patriotism of W.M”? As described last week, on 26 Oct 1768 Gov. Francis Bernard told his Council that the royal army had started renting buildings around the center of Boston to convert into barracks. But soon the Whigs found something new to complain about besides Murray being Scottish. They suggested that he and the governor had agreed on a corrupt quid pro quo. The people were this morning filled with astonishment on hearing that the G——r had nominated and appointed the J——s M——y already noticed in this Journal, as one of his Majesty’s justices of the peace for the county of Suffolk; no appointment of this sort could have been more unpopular, or have raised a more general indignation. The inhabitants being fully persuaded that by means of the steady conduct of our bench of justices in refusing to quarter and billet troops in this town contrary as they apprehend to an act of Parliament, this gentleman was added to their number, and that the G——r will not now want a Justice Gillam, or a more fit instrument to carry his purposes into the utmost execution. 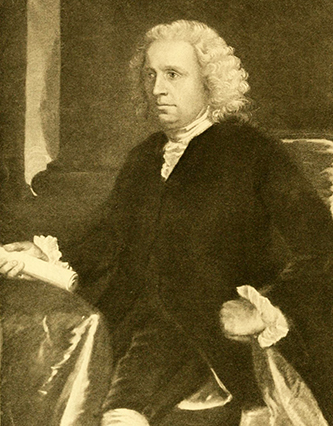 It is given out that when this nomination was made [in the Massachusetts Council], there was silence for a space of time, and such signs of disgust as raised the passions and voice of this G——r, who afterwards condescended to use arguments and intreaties with his C——l in favour of his said friend, which finally prevailed to obtain the consent of a majority of two only. Murray had been a member of the appointed governor’s council in North Carolina before joining his little sister, Elizabeth (Murray Campbell) Smith, in Boston. He wasn’t as wealthy as his sister and elderly brother-in-law, despite his efforts, but he was the sort of mature, genteel merchant who often got picked for political posts in the British Empire. As a native of Britain with family and business ties back there, Murray was a natural Loyalist. That was no problem for Bernard, of course. In “Justice Gillam,” the Whigs alluded to Samuel Gillam, a magistrate in Surrey, England. On 10 May he had read the Riot Act twice to a crowd showing support for John Wilkes, then held in the King’s Bench Prison near St. George’s Field. After that warning had no effect, Gillam authorized soldiers guarding the prison to fire on the increasingly violent crowd. About six people were killed, more than a dozen wounded. A grand jury indicted Gillam for his part in the “St. George’s Field Massacre,” but in July the court acquitted him on the grounds that he had acted within the law. The Boston Whigs feared a similar outcome locally, and used that prospect to link themselves to the London Whigs. However this may be, it is hoped that the people will soon have the satisfaction of knowing whether such steps can be taken by any with impunity; or whether every order and person among us is not equally held to the due observance of law. The Boston Whigs were still arguing that the Quartering Act required regiments to go into the barracks on Castle Island, far from central Boston. They had objected to the army taking over publicly owned buildings. But at this point those activists were also objecting to the army renting private properties from their legal owners. COMING UP: A less likely landlord.